Christian education and Christian schools hold a special place in my heart. I attended Christian school, my dad taught (and still teaches) at Christian schools, I went to a Christian college, and I myself taught at a Christian school. I am a strong believer in Christian education and the importance of Christian schools. But when I look around, I see so many Christian schools that are struggling. Enrollment is down, morale is iffy, and administrators are wondering if it’s really possible to have a thriving Christian school anymore. Let me tell you, it’s not only possible, but it’s more important now than ever. But more often than not, that’s just not the case. Are you ready for some tough love? If you take a real hard look at your school, there are probably some real reasons why your enrollment is down. Reasons that have nothing to do with the economy or the state of the church or anything external. Reasons that have everything to do with the state of your school and some things that you need to improve. But that’s actually good news – these things are within your control. And if you can take an honest look, identify some areas of weakness, and work hard to correct them, then you just might be amazed at how quickly things turn around. Because I have to tell you – There are people looking for quality Christian schools. There really are. And when you build a school that is excellent, people will want to send their kids there. Poor leadership. You’ve heard that everything rises and falls on leadership, and that is absolutely true. You need a leader who has the knowledge, skills, and leadership qualities needed to lead a strong Christian school. Leadership is more than having some good ideas or telling everyone what to do. A real leader needs experience, wisdom, and the right attitude. A great leader knows how to listen to those around him and to lead with compassion, integrity, and genuine commitment. The good news? Leadership can be developed. Start with John Maxwell’s 21 Irrefutable Laws of Leadership. A “good-enough” attitude. When you start settling for “good enough” instead of pushing for excellence, things don’t fall apart overnight, but they start a gradual decline. Like the proverbial frog who gets boiled alive as the pot is turned up one degree at a time, the gradual decline is hard to notice and even harder to push back against. Until one day you look back on your school 5, 10, 20 years ago and think “My goodness, what happened! ?” Good-enough is just NOT good enough. Lack of growth. If you’re not constantly growing and improving, you’re declining. If you’re not intentionally doing something better this year than you did last year, chances are things are gradually getting worse. It’s just the law of entropy. You’ve got to work diligently to improve each year. Yes, it’s hard work, but it’s also well worth it. Resistance to change. Sometimes teachers or administrators get set in their ways and don’t want to try anything new. And while there’s definitely some wisdom in sticking with time-tested principles that are working well, if you fall too much into the “if it’s don’t broke don’t fix it” camp, you’re going to end up with a school full of just-barely-not-broken-but-the-paint-is-peeling-and-everything-is-starting-to-fall-apart classrooms. (No, not literally….But it’ll be just as obvious to that potential new family who’s visiting your school.) You don’t need to jump head first into every new educational trend, but there are lots of fantastic ideas out there. So be on the lookout for them, embrace creative thinking, and foster an environment of positive change and growth. A poor school culture. When too many problems (like the ones above) exist for a long period of time, your school develops a poor culture. What that means is that your staff and faculty are used to these problems and see them as normal. And any new faculty members who come in with excitement and new ideas and are quickly overcome by and assimilated into the general poor culture. What’s more, this poor culture drips down to the students who get used to this type of environment as well. This one is not so simple to overcome. It will take time, but you must be intentional. Start by talking with your staff about what you all want the school to be and the real changes that you will need to make in the culture to get there. Wrong personnel. Sometimes there are teachers, staff members, or even administrators who simply should not be at your school, but that no one has the guts to fire. Maybe you feel bad for them, maybe you worry they’ll make a fuss, maybe you just keep hoping things will get better, or maybe you’re just not willing to go there. But please listen. Firing has to be on the table. Or at least not renewing someone’s contract. If your school hasn’t fired anyone in the last 10 years, that’s probably not a good thing. So please think long and hard before sending out that next round of contracts. And do everything you can to hire the right people in the first place. A focus on rules. Now of course schools need rules. But are rules the focus of your Christianity? When you talk with your students about what following Christ means, does it include a checklist or a relationship? When we spend more time telling our students what they should and shouldn’t do than we do teaching them how to love God, we are not only missing the entire point, we are portraying a Christianity that is empty and completely lacking any power. It’s simply not going to change lives, and it’s going to leave a lot of graduates frustrated, disillusioned, and ready to be done with the whole Christian thing. Not relying on the Spirit for wisdom & direction. I’m realizing that too often “praying about something” means that we mention it to God once or twice and then go ahead and do whatever we were planning to do. This is simply not going to cut it. We have to start seeking God’s face and then waiting for an answer. That means we don’t make the decision until we are 100% sure that God is telling us one way or the other. When we wait to hear that still small voice, we will actually do what God wants us to do, not just hope that we did. And that, my friend, is what our Christian schools most desperately need. These are just a few reasons Christian schools struggle. What other issues should Christian school leaders be on the lookout for? As always, an insightful read. And some excellent arguments made, particularly in relation to staff turnover. I just quit from teaching at a christian that is failing. All the points that you shared are the reason I felt were the reasons why. You hit in one the nail. 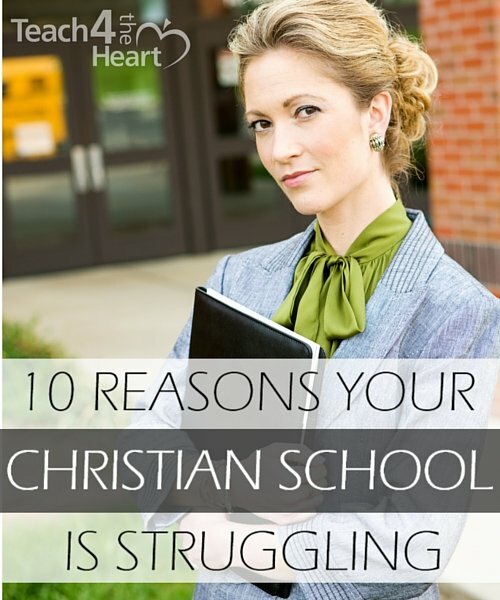 These reasons you’ve listed ate the reason we are pulling our kids out of a Christian school. They’ve lost over 10 staff in 3 years. Most of those were teachers. There’s no stability, nothing new. Kids sit in desks all day. The preschool is so bland, my child learned nothing at all about the Bible. It was taught, but in such a dull way that it doesn’t stick. There’s no community in the school. No family fun nights, no days spent having class outdoors. If they see a drip of rain no one goes out to recess and they sit in the classroom all day. It’s so monotonous. They didn’t money they didn’t have to add high school but with no clubs or activities…there’s no draw for parents. It’s disappointing. I never thought I’d choose public over Christian. I live in the inner city, our schools aren’t great. But I see what is happening with my kids. Their love of learning is being suffocated. Their creativity, their need to run around and be kids. It’s just so restrictive. Why not get out in God’s creation for science class? Why not do community service projects in every class. They’re so tied to one church (that is also struggling) they are losing donors and benefactors. They don’t want any board members from other churches so there’s no new ideas, no openness to change. The school is dying and I’d rather my kids get a good education where school is vibrant and creative and fun. So sad.